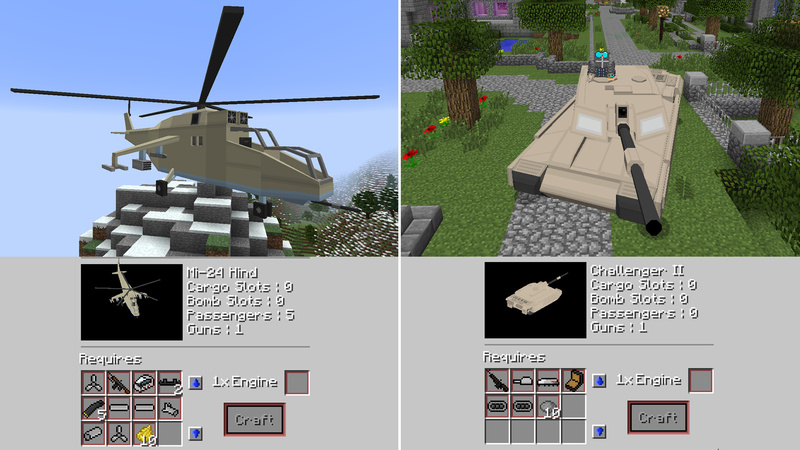 Flan’s Mod adds planes, cars, tanks, guns, grenades and more in a customisable content pack system. Enjoy peacefully flying through the Minecraftian skies and driving through your worlds or get some more destructive content packs and stab, shoot and detonate mobs, blocks and even other players. Every part of Flan’s Mod works in multiplayer and provides additional experiences such as flying large bombers with multiple passenger gun turrets and playing gametypes such as Team Deathmatch and Capture the Flag. Find weapons of many different eras from crossbows, through WW2 guns, to sci-fi laser rifles, and if you can’t find what you’re looking for, you can make it, play it and share it. The mod adds functionality for scopes, shotguns, rockets, grenades, remote explosives, trip mines, medkits and repair tools, and each content pack may add any number of items of each type. The Flan’s Mod teams system allows content pack makers to include weapon loadouts and team setups with custom armour so that you can quickly set up games on your multiplayer server with the content packs you want. Now you can travel around your Minecraft world with speed in a realistic way thanks to Flan’s Mod myriad of different planes and cars. And when you get into trouble, there are a load of tanks, armoured cars, fighter and bomber planes at your fingertips. Bring your friends and take them on a road trip, have them defend your plane from one of the passenger turret seats or go against them in a heated dogfight and see who has what it takes to rule the skies.